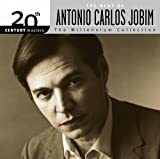 Antonio Carlos Jobim was born in Rio de Janeiro, Brazil, to cultured parents. His father was a diplomat, and his mother founded a primary school. He began formal music studies in his teens, eventually foregoing the idea of becoming an architect. His early influences were the big bands of the ‘40s, West Coast jazz of the ‘50s, composers such as Debussy, Stravinsky, Chopin, Villa-Lobos (introduced to him by his German piano teacher), and, of course, the Brazilian samba. Jobim played piano in nightclubs and made his first recording in 1954, backing a vocalist as “Tom” and His Band. With poet Vinicius de Moraes and vocalist/guitarist Joao Gilberto, Jobim created a new musical style which became known as the bossa nova. It borrowed from the samba, jazz rhythms, and European harmonies. He scored de Moraes’ play Orfeu do Carnaval in 1956 which became the film Black Orpheus in 1959, scored by Jobim and Luis Bonfa. It won both the Academy Award and Golden Globe for Best Foreign Film and the Cannes Film Festival Palme d’Or for its director Marcel Camus. Most importantly, its music fueled the bossa nova fad. When interest in the bossa nova waned at the end of the ‘60s, Jobim turned to scoring Brazilian films. A resurgence of interest in the music brought him back to the international scene in the mid-‘80s when he toured with his own group that included his wife, son, and daughter. Just before his death in 1994, he recorded a collaboration with pop star Sting.